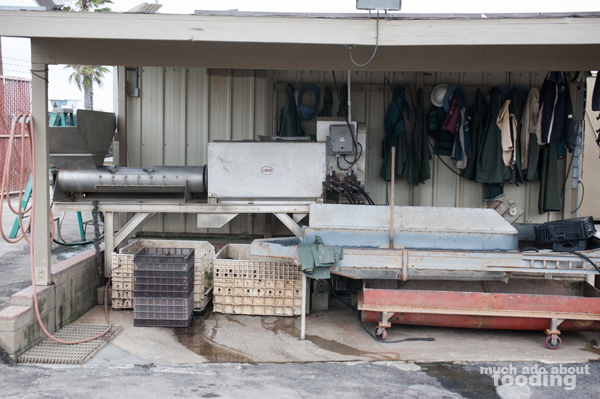 This post is Part II of a four-part series of articles about our visit to Carlsbad Aquafarm. We would like to thank Rebecca Richards & Link Mathewson for making this trip possible and Norman Abell for educating us on their methods of shellfish farming. We were curious to learn more about how their Luna oysters are sustainable after tasting some at Slapfish. What we uncovered was a complex and precise process dedicated to producing the best product possible. If you missed Part I, you can find it here. Back to processing. 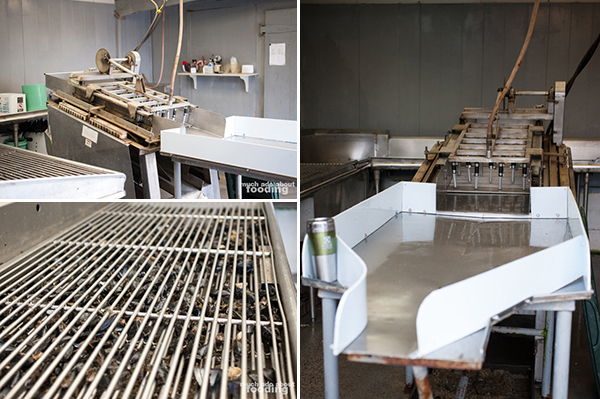 After depuration, a machine cleans the shells more precisely, cutting off mussel beard and preparing the shellfish for ship-ready conditions (many orders go to San Francisco, New York, and even Chicago though the majority stays in Southern California). 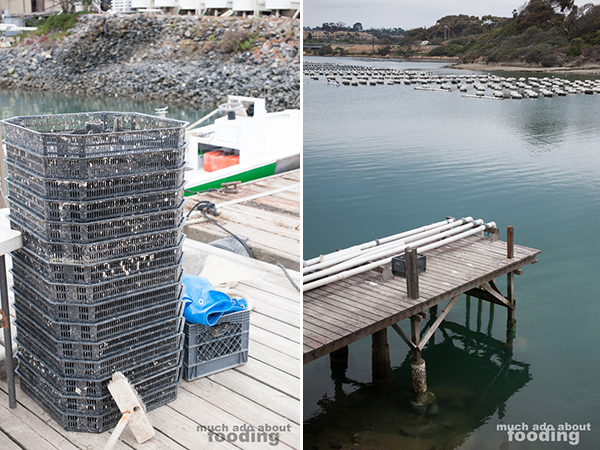 Prior to being completely market-ready, their oysters will go through a rotating tube mechanism called tumbling, to be sorted and graded for size with smaller ones falling through the holes to go back out into the lagoon to be grown a little longer. Another purpose of the tumbling tube is to chip off the outer part of the oyster shell to create the deep cup shape you would see in a restaurant. This is the more preferred market shape and one with which we have grown familiar. Imagine our surprise when we realized that the natural shape of oysters range from flat to three inches in depth to everything in between. The purpose of a deep-cupped half shell? Oysters need to sit on their presented plates by themselves and hold in all of the liquid and tissue. Not only is this for aesthetic purposes but the simulated environmental stress also prods the oyster into feeling normally occurring stress factors which stimulates various growth patterns. This tumbling occurs approximately every three weeks. 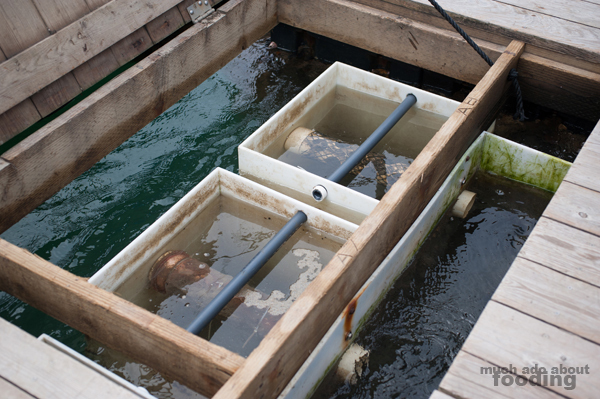 We then walked out with Norman to their FLUPSY (floating upwelling system), an oyster nursery to help the hatchlings grow a little faster from seeds purchased from hatcheries. He pulled up a bucketful of young oysters of various sizes, potentially all about the same age depending on speed of growth. We were shocked at how small these organisms were at this stage but these were even larger than their initial sizes. 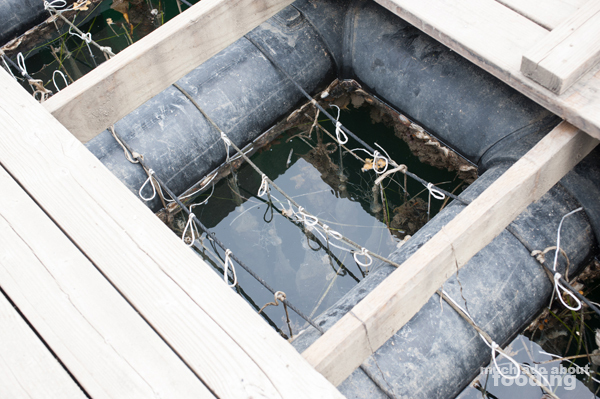 The FLUPSY is used to permit seawater waterflow; each silo containing the baby oysters is protected from predators by tightly woven screens which allow food through but not danger. They provide an abundance of food in a short period of time - there is dense plankton concentration and oyster yield increases significantly. It was a fascinating system of promoting rapid growth and one that Norman likened to the ones used in the Chesapeake Bay area during the oyster restoration period. 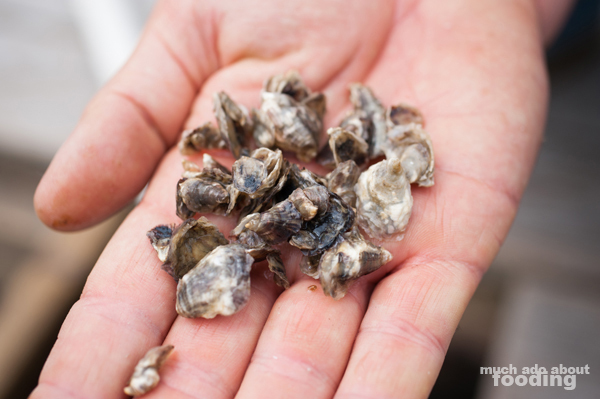 A water quality problem has plagued the Chesapeake Bay area in previous years, and in order to restore both the quality and the oyster population, people turned to speeding up a natural course of action. 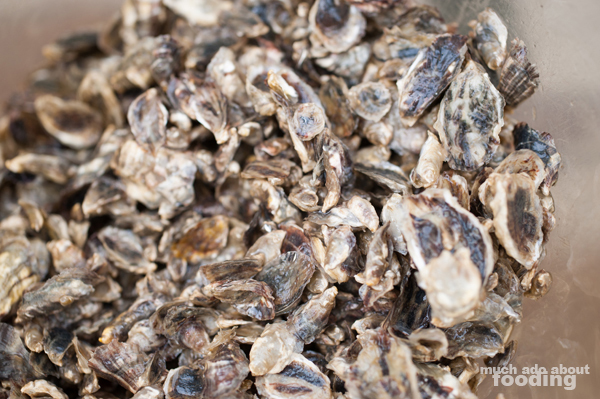 "Oysters are one of the most efficient organisms at filtering water and removing the overabundance of plankton sometimes enhanced by too much nitrogen running off the land. You get a plankton bloom and oysters are good at filtering that out to help make a healthy estuary like this one. It can manage that better than with the absence of that mollusk." 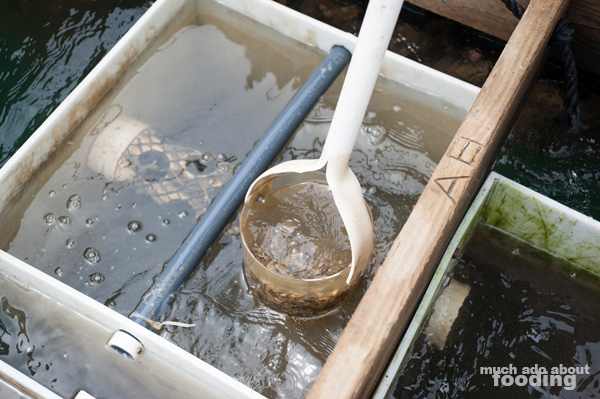 To get into more science-oriented terms, oysters are filter feeders. By beating their cilia, water is pushed over and through their gills. Any plankton or particles become stopped and stuck in the gills' mucus, eventually becoming oyster food. 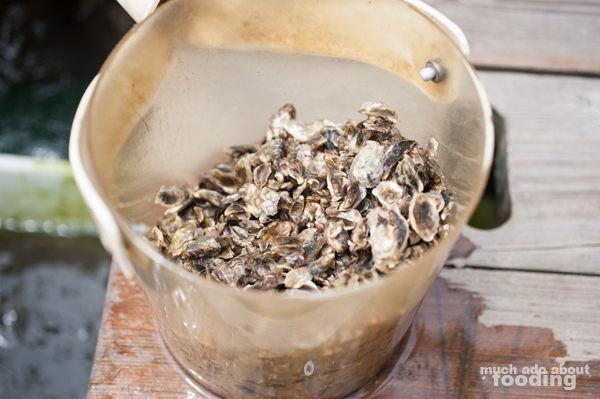 Once digested, that food becomes feces or pseudofaeces in the water, resulting in up to 1.3 gallons of water filtered per hour per oyster. For the bay, oysters were once the main filterers, cleansing through the entire estuary's water supply in a mere three to four days. However, with the decline in population, estimates look at filtering to take nearly a full year. Thus, a restoration effort began. "So with the natural benefits of all the oysters in the area, are you also seeing a rise in healthier water being used for any side projects?" "No we're really not. There's so little that we use that we bring up for other purposes. The biggest benefit is that this area is fairly productive as far as the amount of small fish that thrive here. The floats, trays, mussel ropes, and barrels provide a reef effect, so there's vast populations of fish that hide in there. The brown pelican comes here in the evening to roost. We know if they're here, it's a healthy, well-balanced environment." The power of filter feeders was quite apparent when looking out at the tanks. It was clear that a happy balance with the environment's natural marine life and the manmade farming and filtration systems had been struck. 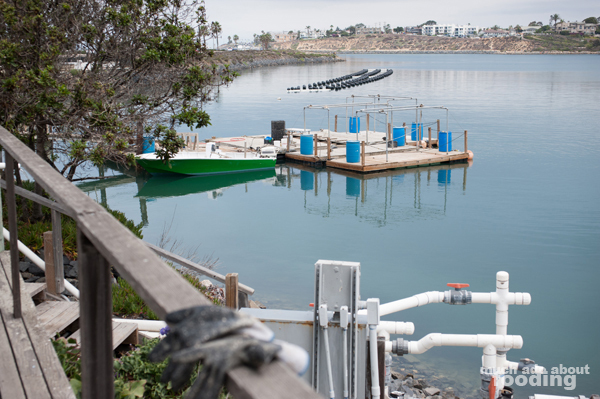 Carlsbad Aquafarm uses suspended long-line cultivation methods and shore-based seawater tanks to reduce their environmental impact on existing habitats and populations. In short, a small carbon footprint is had from beginning to end. "If it's a good year, like any other farm, we'll have a good crop. Nature's doing all the work, and we just help them along." The oysters we saw were to stay in the FLUPSY for 2-3 months before being placed in trays and put out in the lagoon to mature. Norman made it a point to note for us that once the oysters are out in the trays (stacked about 10 high under floats in 20 feet of water), they are not deliberately fed anything. This type of aquaculture, as opposed to finfish farming, allows for the products to eat from nature rather than from manmade feed. Additionally, the environmentally-friendly use of floats, known as off-bottom culture, do not collect a lot of bycatch like seastars or crabs. 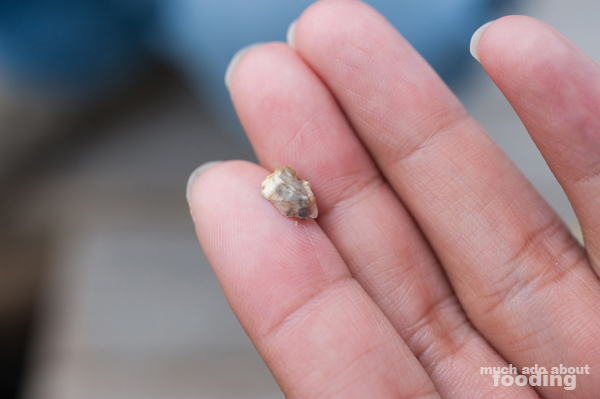 During the larvae stage of the oyster's life cycle, small shell pieces are sometimes added to let the larvae attach and begin their next growth phase. Once they are out in the water, shell creation is continued via the water's available minerals and not from artificial sourcing. Maturation is reached anywhere from 12-16 months depending on desired size and the marine conditions of that year. [UPDATE: Part III and Part IV are now available.] This post is the second of four; Parts III and IV will be featured on the remaining Mondays in September. Part I can be found here. 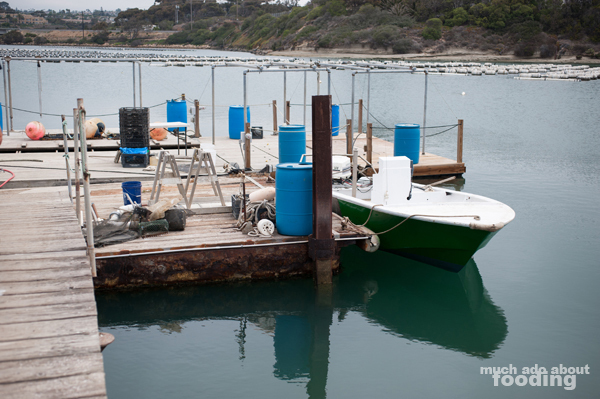 Stay tuned for more information on this fascinating farm and its sustainable aquaculture practices. You can also visit www.carlsbadaquafarm.com! They are located at 4600 Carlsbad Boulevard, Carlsbad, CA 92018 but are unfortunately closed to the public. What's that mean for you, the shellfish-loving fiend? Catch them at one of the farmers' markets or take a step into one of the many restaurants they source to, like Slapfish!